Union Army's 11th Ohio Calvary. 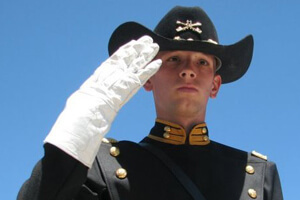 The Troopers are preparing to saddle up and take to the battlefields in a special performance scheduled for Saturday, June 11 in the Indianapolis area. The corps has been invited to perform at the Conner Prairie Interactive History Park near Indianapolis. Opened in 1934, Conner Prairie is Indiana's only Smithsonian Affiliate and a 2010 Institute of Museum and Library Services National medal award recipient. Family-focused interactive exhibits set on 200 acres of land in the suburb of Fishers, enable visitors to experience living history and learn what it was like to live and play in Indiana's past. This June, Conner Prairie will open a brand new $4.3 million exhibit called "1863 Civil War Journey: Raid on Indiana," that tells the story of General John Hunt Morgan's cavalry raid through the Hoosier State. "Recognized as one of the leading and innovative living history museums in the nation, we constantly challenge ourselves to find new ways to connect and engage with our guests," says Conner Prairie President and CEO Ellen M. Rosenthal. "This is our first exhibit that will fully combine the artistry and magic of technology with the authenticity and warmth of our interpreters dressed in authentic period costumes." Morgan's Raiders as part of Connor Prairie's new exhibit. The Troopers will be part of the opening week of events for the new interactive experience, with two performances on Saturday, June 11 first at 1 p.m. ET and then again at 3 p.m. The appearance is a good fit for "America's Corps," whose military inspired uniforms are fashioned after the Union Army's 11th Ohio Calvary. During the Civil War, the 11th Ohio Cavalry was stationed at Platte Bridge Station in the corps' hometown of Casper, Wyo. At the Conner Prairie event, the Troopers will perform period pieces including "Battle Hymn Chorale" and the "Trooper Medley," in addition to excerpts from the corps' 2011 production "The Road Home." Drum corps fans can get a special discount on admission to Conner Prairie for the day of the performance. Download the coupon at ConnerPrairie.org. 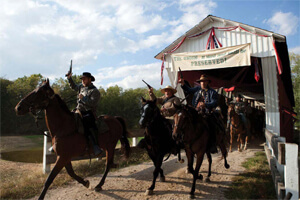 Learn more about "1863 Civil War Journey: Raid on Indiana."